Wal-Mart Stores, Inc. operates retail stores in various formats worldwide. The company is member of the S&P 500, Dow Jones Industrials Average and the S&P Dividend Aristocrats indexes. Wal-Mart Stores has consistently increased dividends every year for 35 years. The company announced a 15% dividend raise in March 2009, plus a $15 billion stock buyback initiative last month. Between June of 1999 up until June 2009 this dividend growth stock has delivered an average total return of 1.10% annually. The stock is trading below the levels it was changing hands a decade ago. The company has managed to deliver an 11.60% average annual increase in its EPS between 1999 and 2008. 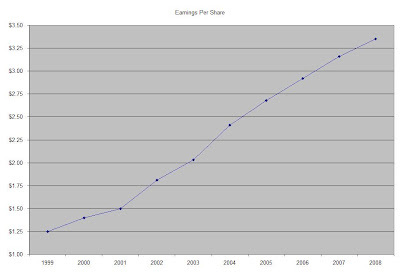 Next year Wal-Mart is expected to earn $3.55 share, followed by $3.90/share in FY 2011. With growth slowing down, the price/earnings multiple could contract even lower. This being said I believe Wal-Mart is an excellent business, as it always investing in innovation that helps control inventory and focus on certain types of merchandise that offsets weaker demand in recessions. Despite the expected slow down in consumer spending, Wal Mart is well positioned with its diverse product mix of consumer staples and foods that it is offering on its shelves. It has lower prices in comparison to its competitors, which could drive more traffic for the retailer. Just like Walgreen (WAG), Wal-Mart Stores expects to slow down on the rate of opening new stores and instead would try to focus on developing the profitability of existing locations, without cannibalizing sales in its existing outlets. A potential growth area for the company are its international joint ventures in China, Brazil, India and Chile. The Return on Equity has ranged over the past decade between a low of 20% and a high of 22%, with the exception of 1999. Rather than focus on absolute values for this indicator, I generally want to see at least a stable return on equity over time. Annual dividends have increased by an average of 18.90 % annually since 1999, which is higher than the growth in EPS. The disparity is mostly due to a gradual increase in the dividend payout ratio and the billions of dollars the Bentonville, AR based retailer has spend on stock buybacks. 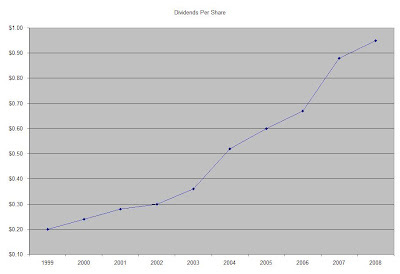 A 19 % growth in dividends translates into the dividend payment doubling almost every four years. If we look at historical data, going as far back as 1976, Wal-Mart has actually managed to double its dividend payment every three years on average. The slowdown in capital spending could free up more cash for dividend increases and share buybacks. Thus, despite expectations for EPS growth of 7% over the next few years, Wal-Mart could still manage to deliver low double-digit dividend growth. The dividend payout ratio has been on the rise, although it is still much lower than my 50% threshold. A lower payout is always a plus, since it leaves room for consistent dividend growth minimizing the impact of short-term fluctuations in earnings. Currently Wal-Mart Stores is trading at 14.20 times earnings, yields 2.20% and has an adequately covered dividend payment. The company does spend a lot of its cash flow on stock buybacks, which could prove beneficial in the long run since it could provide above average dividend growth over time for the same effort. Most analysts are bullish on the stock, but this could be a recency bias due to the strong performance of the stock in 2008. Although I really like the company, I don’t want to pay top dollar for it. Thus I would consider adding to my position there on dips below $40.